Our summer musical, a revival of You're A Good Man, Charlie Brown, It is a fresh approach to the all-time 1967 classic. 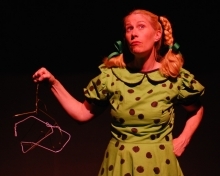 Sally Brown joins Charlie Brown, Linus, Lucy, Schroeder and Snoopy in this version. Two new songs, Beethoven Day and My New Philosophy, have been added to the twelve wonderful numbers of the original version, such as My Blanket and Me, The Kite, The Baseball Game, Little Known Facts, Suppertime and Happiness. The time of the action is an average day in the life of Charlie Brown. It really is just that, a day made up of little moments picked from all the days of Charlie Brown, from Valentine's Day to the baseball season, from wild optimism to utter despair, all mixed in with the lives of his friends (both human and non-human) and strung together on the string of a single day, from bright uncertain morning to hopeful starlit evening. The 1999 revival of Charlie Brown won two Tony Awards and three Drama Desk Awards. Come have a happy day with the Peanuts gang! 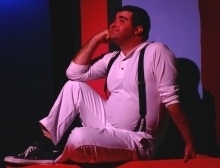 Actors Ensemble of Berkeley is presenting You're a Good Man, Charlie Brown as a celebration of the life of Ralph Miller, an exemplary Bay Area actor and long time board member of Actors Ensemble. Ralph's delight in the theatre will be honored with each performance. Actors Ensemble of Berkeley premieres "You're a Good Man, Charlie Brown" on July 17th and the musical runs through August 15th, Fridays and Saturdays, with an extra performance on Thursday, August 13th. All performances are at 8 pm at the Live Oak Theatre in Berkeley. Tickets are $15 or $12 for seniors and students (with ID). Order tickets at www.aeofberkeley.org. Download high resolution photo With new songs added, the hit musical, "You're a Good Man, Charlie Brown" brings together again Charles M. Schulz' legendary "Peanuts" characters Linus (Ted V. Bigornia), Lucy (Michelle Pond), Charlie Brown (Kyle Johnson), Snoopy (David Irving), Sally (Shay Oglesby-Smith), and Schroeder (Davern Wright). Photo by Eric Carlson. With new songs added, the hit musical, "You're a Good Man, Charlie Brown" brings together again Charles M. Schulz' legendary "Peanuts" characters Linus (Ted V. Bigornia), Lucy (Michelle Pond), Charlie Brown (Kyle Johnson), Snoopy (David Irving), Sally (Shay Oglesby-Smith), and Schroeder (Davern Wright). Photo by Eric Carlson. Download high resolution photo Charlie Brown (Kyle Johnson) looks to Lucy (Michelle Pond) for advice in Actors Ensemble of Berkeley's revival of the hit musical, "You're a Good Man, Charlie Brown." Based on Charles M. Schulz' legendary "Peanuts" comic strip, "You're a Good Man Charlie Brown" boasts new songs added to the charming original score. Photo by Eric Carlson. Schroeder (Davern Wright) lectures on the virtues of Beethoven to Sally (Shay Oglesby-Smith) in Actors Ensemble of Berkeley's revival of the hit musical, "You're a Good Man, Charlie Brown." Based on Charles M. Schulz' legendary "Peanuts" comic strip, "You're a Good Man Charlie Brown" boasts new songs added to the charming original score. Photo by Eric Carlson. Download high resolution photo Charlie Brown (Kyle Johnson) has had enough with Snoopy (David Irving) in Actors Ensemble of Berkeley's revival of the hit musical, "You're a Good Man, Charlie Brown." Based on Charles M. Schulz' legendary "Peanuts" comic strip, "You're a Good Man Charlie Brown" boasts new songs added to the charming original score. Photo by Eric Carlson. With his favorite blanket, Linus (Ted V. Bigornia) ponders the mysteries of life in Actors Ensemble of Berkeley's revival of the hit musical, "You're a Good Man, Charlie Brown." Based on Charles M. Schulz' legendary "Peanuts" comic strip, "You're a Good Man Charlie Brown" boasts new songs added to the charming original score. Photo by Eric Carlson.